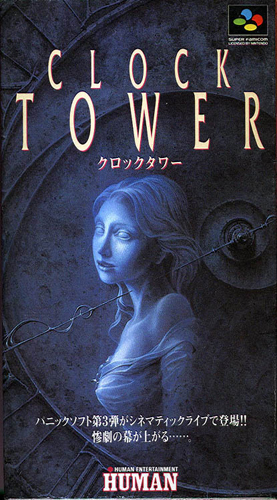 Considered by many to be one of the earliest games of the survival horror genre, Clock Tower (Later subtitled The First Fear) is a little known gem in the history of gaming. Originally released in Japan and later into the US, this retro hit is a surprisingly suspenseful and jump-worthy game that will have most on the edge of their seats. It’s September, 1995 when four orphans are led to a mansion known as the “Clock Tower” due to it being its most prominent feature. Being led by a Ms. Mary, Jennifer, Anne, Laura and Lotte arrive at the foyer of the luxurious mansion and are eager to meet their adoptive father, Simon Barrows. Fear begin to set in as Mary soon disappears and Jennifer finds the other gone, leaving her to wander about the dark hallways of the mysterious Clock Tower. With horror games like Dead Space, Slender and Outlast, I was sure that a simple, pixel SNES game wouldn’t even come close to scaring me. I had heard about it before – being credited as one of the inspirations for future instalments of the genre. But even with that in mind, I carelessly decided to play it in the darkness of my room, deciding that it would be one of those games that you could simply breeze by. I was wrong. I was surprised by how “survival” this point-and-click game was. I had played the original Resident Evil and Silent Hill games and considered that formula to be survival horror. 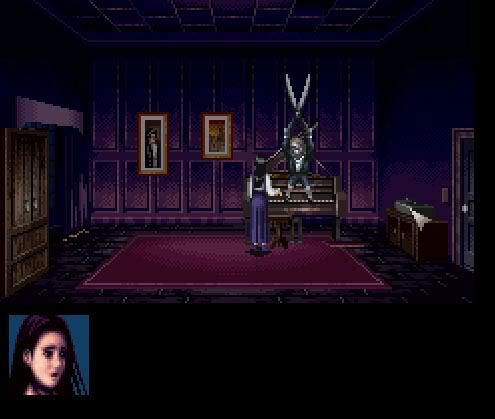 Yet Clock Tower takes it to an unbelievably base level – with no weapons or offensive items, the best Jennifer can do is hold off the dreaded Scissorman for a few seconds before her life depletes, forcing the player to find hiding places to avoid the maniac. Interestingly enough, her health depletes from running, and if you’re being chased by the game’s slasher, you’re prone to tripping onto the floor, something which I found annoying in films but suspenseful in this video game. The controls are, as you would expect, very basic: Jennifer can only run left and right and interact with objects you click on. It is through this that she collects key items and progresses the story. The introduction of a “panic button” is also important, as it allows Jennifer to escape or complete tasks that would otherwise damage her. The game itself incorporates puzzle elements, which is actually quite difficult in some segments. It also features slightly different plot points in different game plays, often changing room or item locations. The most attractive feature of all in my opinion though, are the multiple endings that players can achieve. Those familiar with Corpse Party would enjoy this aspect, yet some ending criteria can be missed or obscured by gameplay alone, making it difficult to achieve all endings. Clock Tower’s tense atmosphere is close to flawless, providing players with a sense of anxiety and insecurity about what they inspect and what rooms they enter. Most of the mansion is portrayed with dull colours, diverting from this in the few rooms where there are light switches. Certain events, which are shown to players in a cinematic still, are sudden and grotesque, catching players off guard. The music doesn’t help players in this regard – it only manages to heighten the suspense and tension already instilled in players. As a whole, I was surprised by how well Clock Tower fared as a suspenseful survival horror. Not only did it completely change my initial opinion, but it also genuinely kept me frightened until I finally completed the game. It’s difficult enough to warrant multiple playthroughs, especially with multiple endings, but keep in mind that some interactions can become tiresome after awhile. if you’re looking for a good thrill, are a major retro-junkie or want to experience some real gaming history – turn off the lights and give Clock Tower a run for its money. Recommended? Basic, but a great cult classic.